When out grocery shopping with my daughter last week, we happened to see a cute arrangement of a Candy Bar Bouquet in the floral gift shop area. Great idea, we thought! However, they were $20 for just one. Not so bad, if you're a non crafty person, like me! But, my creative daughter took one look at it and, of course, said "I can make a bunch of these for 20 bucks and give as gifts." That's exactly what she did. Not to mention, SCORE for us, I already had the mason jars at home, which I had leftover from her grad party this past summer. If you don't have a stash of mason jars, you can buy a case of 12 jars for under $10 at Target. 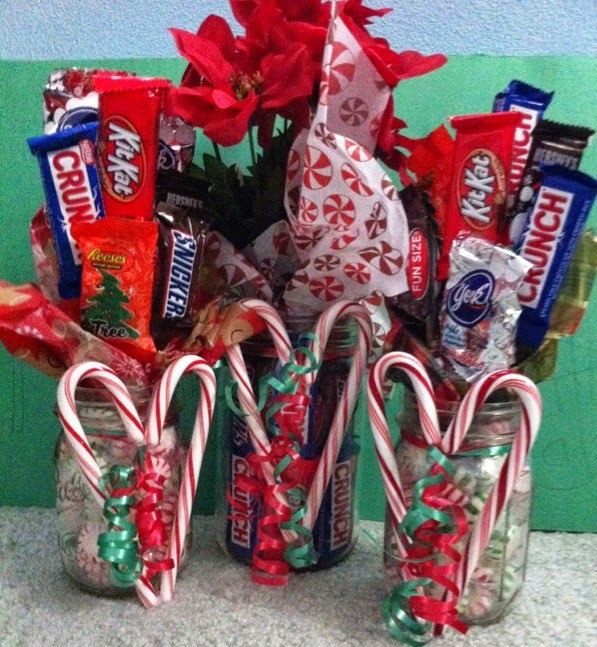 In addition, we purchased mini candy bars, candy canes, peppermint candies, shish-kabob sticks, tissue paper and ribbon. You'll also need a hot glue gun. She placed the peppermint candies in the bottom of the jar and then cut the shish-kabob sticks down to size, cutting different lengths to create varying heights for the bouquet affect. Use the hot glue gun to secure the stick onto the candy bar. Place each candy bar stick in the jar, pushing down among the peppermint candies. Then, use a sheet of Christmas tissue paper to stuff behind to dress up the bouquet and camouflage the sticks. As seen in below picture. 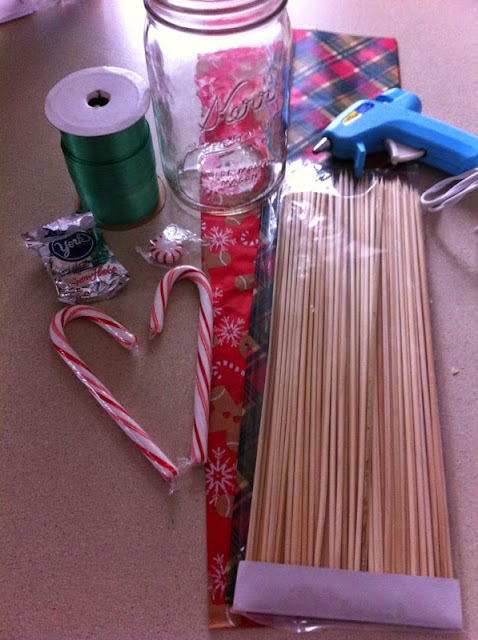 Hot glue the candy canes to the front of the jar to create a heart shape and tie ribbon around the jar to jazz it up and look festive!! I suppose the candy cane heart is optional, but I really thought this added a great touch to the whole thing and screams Christmas!! Supplies needed are pictured and listed below. 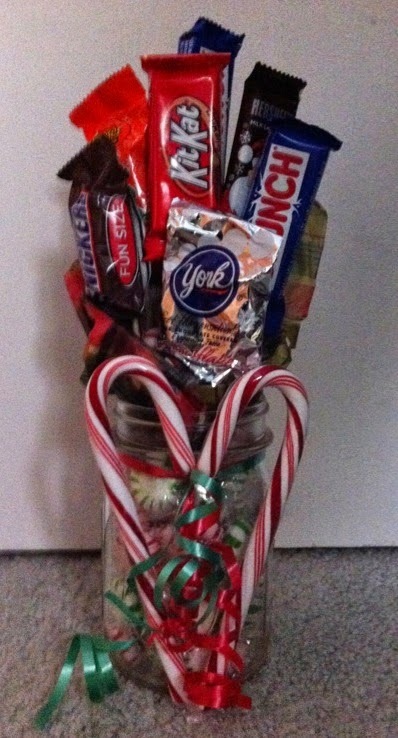 Sorry, I didn't get a picture of all the candy, as it was all used for our gift jars, but I'm sure you get the idea. I'm imagining this idea is all over Pinterest already, but this is our version and hope you can use this as a holiday gift giving idea! Merry Christmas and have a wonderful New Year!